The Eldridge House (or hotel) was built in Lawrence, Kansas Territory by the New England Emigrant Aid Society. It was an unofficial headquarters for the free state movement and, as such, it was targeted for destruction by Sheriff Jones' proslavery posse, which sacked Lawrence on May 21, 1856, less than two weeks after this document was created. 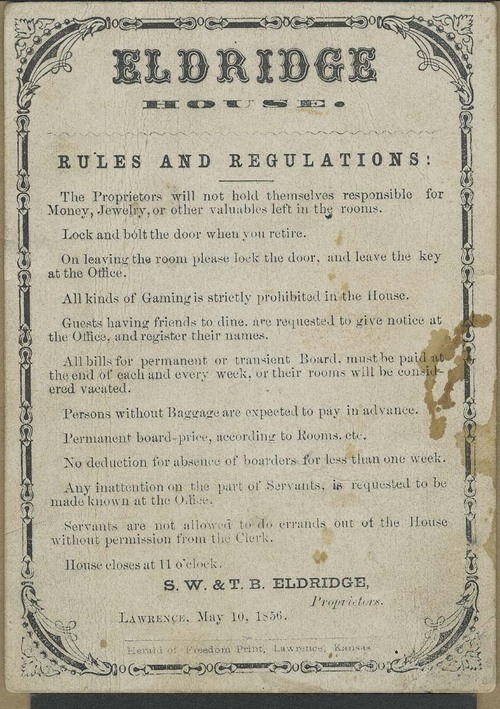 This pocket-sized card contained twelve "rules and regulations" for residents, including the admonition to "lock and bolt the door when you retire," a prohibition against "all kinds of Gaming," and the notice that "persons without Baggage are expected to pay in advance." Collections - Manuscript - Leonard, Oscar E.